7.11.2014. 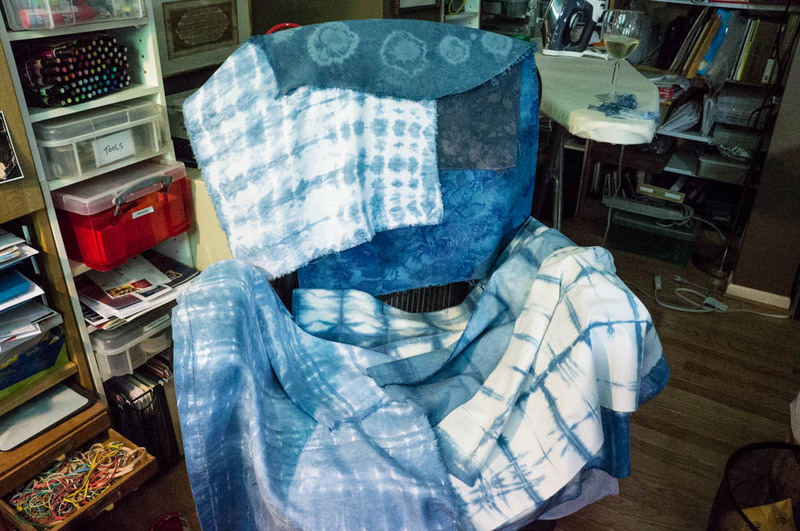 I bought an indigo dye kit. And I've been saving it for a sunny summer's day, when we could go outside and have a project on the back deck. Wednesday was just the perfect day. Why indigo? 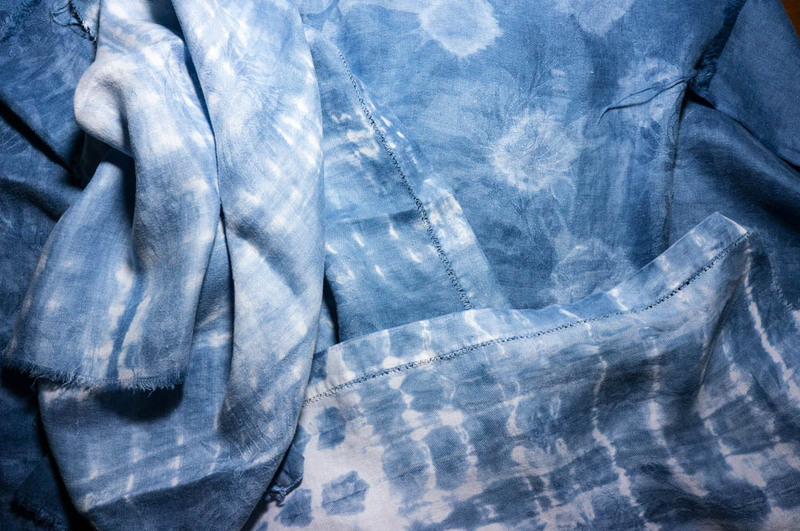 Beyond my simple love of blue jeans, indigo has deep roots in many cultures. I'm not adept at "easy." I tried the dyeing technique where you "just" scribble on cloth with a fat Sharpie and spray with isopropyl alcohol for "amazing" results. My outcome? Hideous. I keep crossing paths with indigo. 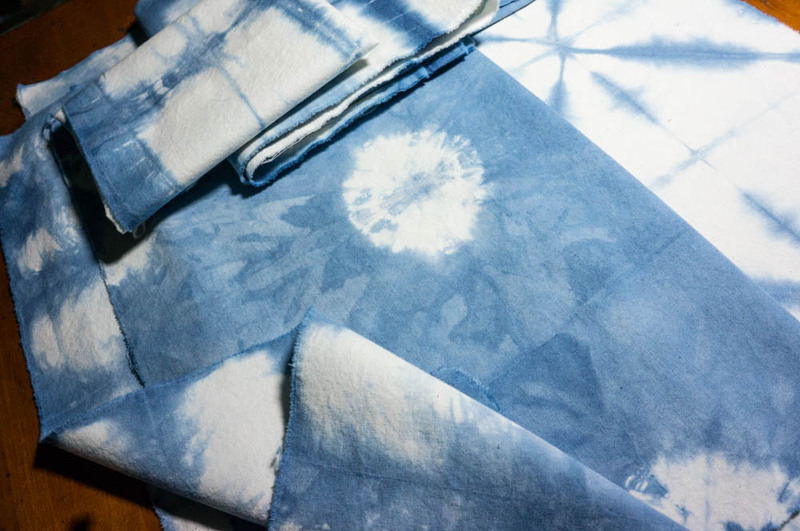 I covet vintage Japanese cloth, whether painstakingly tie-dyed in shibori or as a component of vintage boro items, such as those sold by Sri Textiles in Brooklyn. 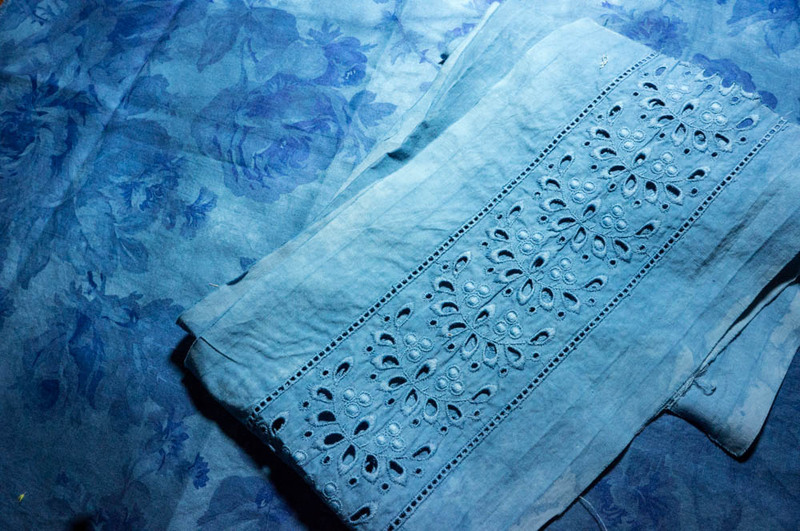 I long for vintage ndop, a patterned indigo cloth from Cameroon, Africa. Short of actually paying the price to acquire such cloth, I can enjoy the process of figuring out how to make my own versions. I don't have a specific purpose in mind, other to build up my stash for winter projects to come. Yes, I bought the supplies to do resist techniques, but I better start at the beginning... learning to work with indigo. So Wednesday, we set up our workshop on the deck. I had planned to go all chem lab, with photos and log notes, but we were simply swept away by the process. Process. We started out by mixing the indigo powder and reducing agents (soda ash and thiourea dioxide) into 4 gallons of water. Then, slow clockwise stirring. Then, it rests. 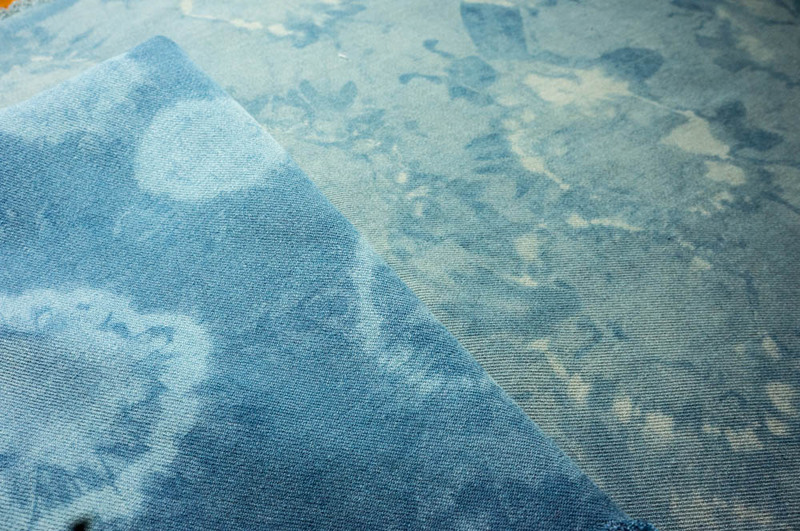 Slowly, the mixture "blooms" with dark blue bubbles and coppery sheen. Scoop this flower off to clear the way for to dip cloth into the chartreuse mixture below. Cloth prepared: rectangles of unbleached muslin; linen from a thrift-store white damask tablecloth; and some vintage eyelet-embroidered trim. For an over-dyeing experiment: scraps of silk twill from old blouses (blue and pale muted green); a scrap of 1980's dusty rose cotton; and a length of white cotton printed with giant blue roses. 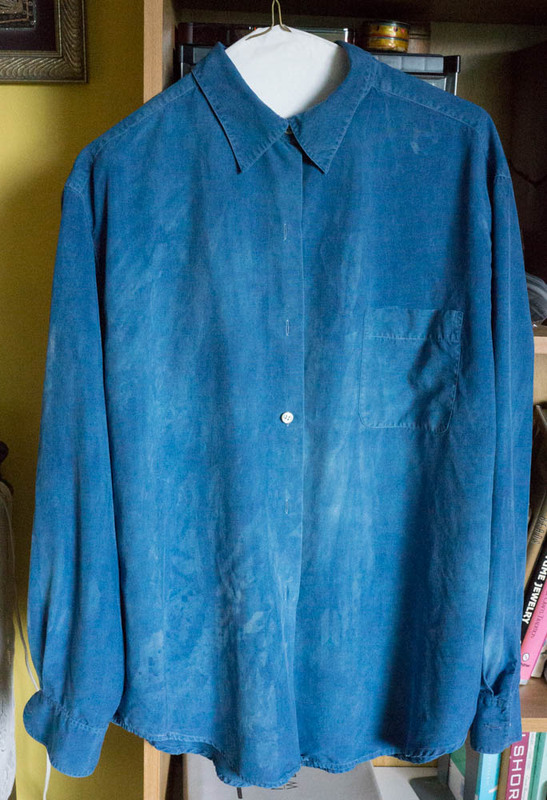 And from the back of my closet: a dull gray-blue silk blouse (J. Crew) and an insipid blue linen jumper (J. Jill). So far, we've had three sessions of tying, dyeing, "developing" (watching the green turn to blue, opening the tied bundles, etc. 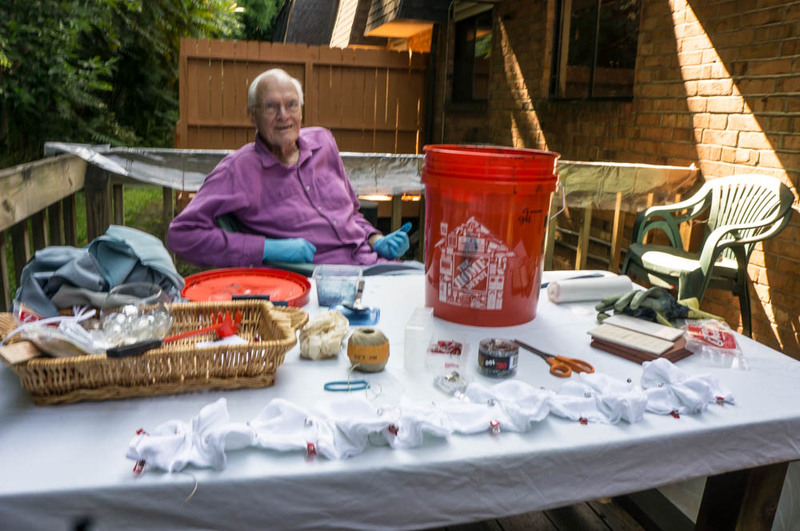 ), washing (in hot with Synthropol, with Color Catchers), drying, and ironing, over the course of two days. We were winging it, really. But the results were cool. Grey-blue silk blouse. I tried to get the whole blouse to dye evenly -- twice -- but it was left with some uneven mottling of a non-artsy nature. But where the color is good -- oh, so lovely. And after repeated washings -- much to my surprise -- the hand of the fabric is more luscious and yummy than it was at the start. It might wind up being a good upcycling project. In general, there was a kind of yumminess to the resulting fabrics. The colors are very soft and the patterning very complex. The whole thing put big smiles on our faces.